Silver, is this a new DM for you? Who is trying to "grow" with the company, and what do you mean by that? What kind of questions are you asking? It doesn't make sense that they are yelling at you for no reason. Maybe they're crazy - I don't know. Can you provide some details so we can help you through this? Most DM's are willing to be helpful as long as you are being productive. Do you feel as though you have improved this year and are being productive? Are you always on time? Are you regularly reliable and willing to do whatever it takes to get things accomplished? How many miles per week are you averaging? We just need some better information if we're going to help you with this. Actually the answer would be C and D. The split sleeper berth rule currently allows you to split your 10 hour break into an 8 hour break in the sleeper and a 2 hour break as off duty. I'm thinking Splitter is so tired right now, he's not reading the question correctly. I know Rainy taught him how to understand this little mystery better than that. The key to making money in regional flatbed is efficiency in loading/unloading, and being smart with your clock. We always enjoy hearing from you. It's really great to hear you're doing so well. You would not want to choose CPM over %, and I have the numbers to back that up, as I'm tracking every mile, every %, and every CPM, etc. Solo, you are brand new at this, and you started during a time when flat bed rates were pretty decent. You have one month of number crunching - that's not very credible evidence to base a decision on. Freight rates are extremely volatile at times, and there are market forces that move them up and down in very cyclical patterns. Be careful giving out advice like this. Even regions of the country vary considerably. After a couple of years of doing this, I'm fairly certain you'll find your numbers to indicate that there's very little difference in percentage pay and mileage pay. We had another TMC driver go through this same comparison and he found his pay would have been very similar no matter which way he went. Ask yourself this question... Why would TMC offer you a choice of how you get paid, knowing full well that they are going to have to pay you a lot more if you choose the one they actively promote to their drivers? Percentage pay is actually designed to protect the company from the volatility of the rates. That's something you haven't had the pleasure of experiencing just yet. Bruce, an APU is merely a generator. It provides power. It also has an A/C unit that it powers for comfort. You accomplish those same things idling the engine and using an inverter. Most companies don't use them because of the expense and maintenance. I've never had an APU, and certainly never thought I needed one. I certainly wouldn't consider it a criteria for employment. Most everyone I've talked with who has one spends more time than they would like in the shop having it repaired. Sure, they are nice, but nowhere near a necessity. I'm cleaning my tarps right now. 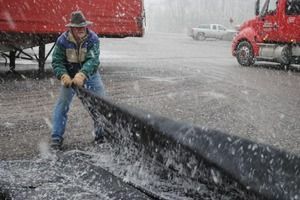 I'm parked at the Pilot in Shepherdsville, KY. My load is tarped and the rain is beating all the road grime off of them. I have laid them out in a Blue Beacon bay and had them spray them down, but that was after using them on a load of Municipal trash out of Long Island, NY. They were stinking pretty bad, and I didn't think the next customer would appreciate their metal smelling like that. Scott, we're proud to have you in here, and glad to hear you're doing so well going backwards. But... you need to be careful giving out advice like this. People get their whole careers cut short by going local first. We see it often. There's always a few exceptions, and we've got a few of those exceptions in here. Most of them readily admit that they got lucky. There's a lot more issues involved than just backing. We teach best practices in here. We do that because they produce the best results. There are a lot of reasons why most local jobs require one year of OTR experience. So, we don't just encourage newbies to avoid local jobs because they might not be good at backing the truck. Sure, that is one part of the problem, but there are plenty of other issues involved. Any job that is safety sensitive like trucking should be a approached with incremental steps into the learning process. Taking a local job first bypasses many of the opportunities for learning how to handle a rig in all sorts of situations. It's not recommended here. HELP TO RENT A TRUCK FOR CLASS A CDL ROAD TEST IN JACKSONVILLE FLORIDA. Well, most of the schools provide transportation to their facility, housing, and meals. What are ya waiting for? Welcome to our forum Freeborn A! We don't really recommend renting a truck for testing. We try our best to teach "best practices" when starting this career. We like to help people make a good solid start at this, and typically that includes at least a 160 hour training school which will provide you with a truck for testing. Are you aware that most companies who hire inexperienced drivers will have to have your "training certificate" on file? Maybe you don't need a job, or maybe you have other reasons for obtaining a CDL, but we generally advise people to look into Paid CDL Training Programs. I guess Black Smoke doesn't matter. Not that I thought they ever did, but there certainly was a lot of commerce taking place on the 12th. Super T, welcome to our forum. We really don't spend much time here giving information out like this. We focus on helping new drivers make a good start into trucking. We have a few members who are Owner/Operators, but it is not a business model we generally recommend. You should go to OOIDA. Get a membership and they will be a big help to you. You may get a few responses from some of our O/O's. I'm not sure, but we can wait and see. Hey Jamie, I guess the way I worded that kind of sounded as if I took a jab at you - I apologize, it wasn't meant that way. My point was that we are always responsible for getting ourselves to the level of pay we want to be making. I'm not talking about CPM, but rather, the ability to get things done. Street smarts play a huge role in this ability. Knowing how to make things happen in our favor will boost our overall income more than anything. Being at the top of our class in CDL school is irrelevant. Bruce's friend is a rookie, and he's experiencing rookie issues. The only way to get past that is to press through, gaining valuable experience, while focusing on improving his results. This is at the heart of the reason many people fail at this career. They get discouraged with their pay, and then they turn their focus to how bad their employer is, or how unfair the whole industry is, or maybe how their current company doesn't pay enough. You name the issue they focus on and you can find instant access to a ton of support for their complaints online. The problem is that they're all beating the same old dead horse. The way you get better results in your paycheck is to produce better results in your performance. When I wasn't seeing good paychecks as a new driver, I would often say to myself, "Man, I've got to figure out how to get better at this - I'm not going to be able to live on this amount of money." I started at 27 CPM, and never really thought about it being low. I knew I had an opportunity to make it work. My low pay rate actually contributed to my accomplishments of taking on the learning curve and learning to be productive. I didn't blame my low paychecks on my location, my employer, or any outside factor. I figured they handed me the ball, and it was my responsibility to do what it takes to score. There is always this reckoning we deal with in trucking. If our focus is on the wrong things we will very seldom advance our careers. Do I Have What It Takes To Make It In Trucking? Unless the regional position is giving you a guaranteed salary if you meet the "quota"? You're gonna make squat. Even meeting the quota can be a problem. You're not likely to get enough miles to make it worthwhile earning whatever cents per mile. I cannot understand what you guys are talking about. Regional jobs can really be great. What is the problem you guys have with them? Understanding how to be productive is always key to your success out here. We've got another thread going where people are whining about not making enough money because they're stuck in the Northeast. I make way more money than the "average" driver, and I spend most of my time in the Northeast! The key to making money in trucking has very little to do with your job, your company, or your area. You've got to figure out how to be above average - you've got to be productive. You can't lay the blame for below average performance on anybody else - you are in charge of your productivity, not your dispatcher, not your company. I wish I had more time to deal with this subject, but I've got to get on the road. Hopefully some of you will respond and I can jump back in here later. John, if you're genuinely interested in a local type job, I highly recommend you at least make a commitment to doing over the road for one year to build a foundation for your career. It's very difficult starting out local - mostly because they generally require a minimum of one year of experience. I don't have the time right now to go into all the reasons behind this, but if you'll read this article I think it will help you understand how best to start this career. Failed drug test, never done drugs. Roy B, your associations with users seem to be very close and tight. You're even married to one. Personally, I would take a different lesson away from all this than the one you took, but that's just me, and my handle describes me pretty well. I'm glad you're not using, but you sure could put a little more distance between yourself and those that do. You say you've started divorce proceedings - perhaps move somewhere else and start all over with a new set of friends would be wise also. We all hope the best for you, but we also know a failed drug test is just about impossible to overcome in this career. only two and a half cents a mile but I was happy to get that. 2 and a half cents is a big raise! That's nothing to sneeze at. Congratulations! Could you explain what an "overhead" accident is? That description of an accident already sounds like you haven't learned much from this. I completely agree with Rob. Own it and learn from it, otherwise you'll never advance in your trucking career.